About 20 years ago, we took one of our first top to bottom rides along Ecuador’s coast with our friend Kjetil Haugan. 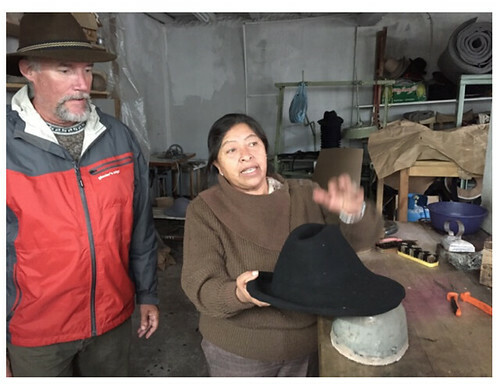 Merri and I and Kjetil had all recently discovered the amazing values in Ecuador and were seeking knowledge and bargains. We found them aplenty and since the three of us took that trip Kjetil has created a luxury hotel & spa, and a housing development on Ecuador’s coast, opened the best jungle lodge in the Amazon and offers Galapagos cruises on three of the most luxurious vessels in the islands. 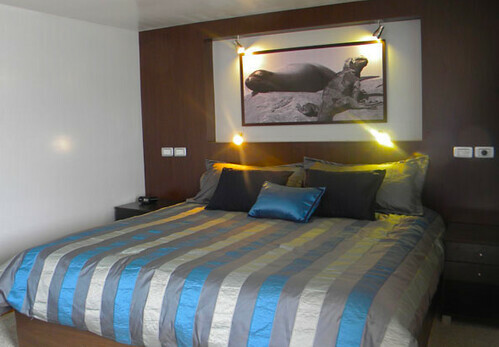 Now he has added more Ecuador service, a luxury Galapagos hotel. Kjetil recently sent me this note. We are proud to share with you our latest venture in providing the highest quality of luxury services in the Galapagos Islands. 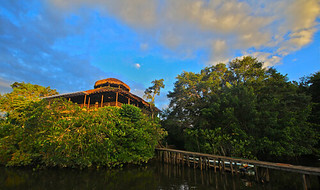 What was previously the Red Mangrove Aventura Lodge will now be known as the Red Mangrove Hotel by Haugan Cruises. As you know, Haugan Cruises operates three motor catamarans of the highest luxury standard. Now, the Red Mangrove will be added to this list of Galapagos products with the added plus of guaranteed excellence you already know Haugan provides. Rooms are sold by night and guests have the option of purchasing 4 and 5 day packages. They can do this with activities included at popular attractions found on Santa Cruz like the Charles Darwin Station, beautiful beaches, and more. The hotel, located on oceanfront property with direct views of Academy Bay, is surrounded by lush gardens, mangroves and the occasional visit of friendly sea lions and marine iguanas. It is a traveler’s delight to visit and relax at the hotel, and perfect because of so many activities like snorkeling and hiking can be done within five minutes from our location. Throughout the year we will renovate the entire hotel in order to offer the same standards of luxury Haugan Cruises is known for. Meanwhile, we will be operating as normal with availability beginning May 2nd, 2017. Be part of this new adventure with us and take advantage of our Special Kick Off Promotion at the Red Mangrove Hotel where guests can reserve 2 nights and receive the third night free! Contact us directly via email or telephone today to learn more! 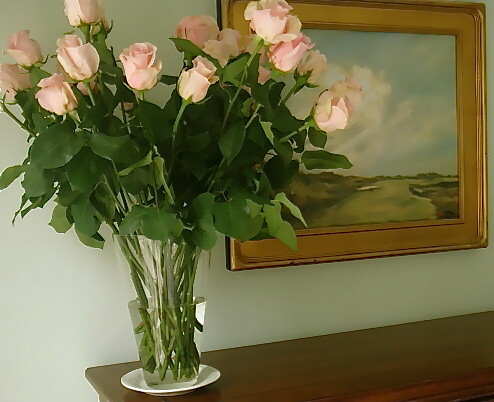 Orders for fresh Mother’s Day roses will be accepted through Monday May 8, 2017. 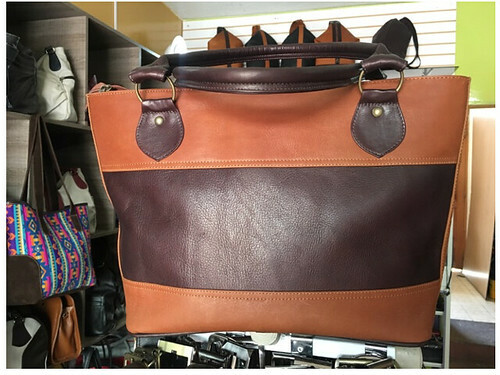 Yesterday’s message looked at how Andean products are hot this season and how to save on Ecuador shopping and even make the trip tax deductible. You could even make part of a Galapagos cruise to Ecuador tax deductible if you are Ecuador shopping for profit. 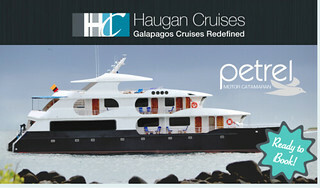 Haugan cruises provide discounts on Galapagos cruises specials (1) to Ecuador Living Club members. If you are going to Ecuador for a business meeting or to take an export tour your flight, and hotel, can be tax deductible. When you know the rules, it’s easy to deduct travel to a business meeting, even by cruise ship. The law provides various ways to deduct cruises. Let’s examine just one: a trip to Ecuador. 2) Transportation cost to a foreign destination for seven days or less, excluding the day of departure, is not subject to an allocation between business and personal days. 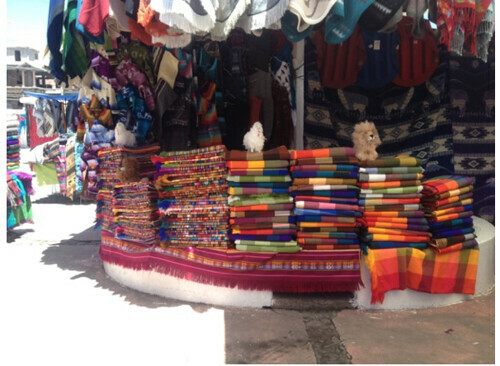 Take for example a trip to Quito for an export tour, with a Galapagos cruise included. Quito is outside the 50 states; accordingly, it’s a foreign destination. You are subject to the foreign travel rules on your trip to the business meeting or convention in Ecuador. Note that you have no personal, nondeductible expenses for this trip to Ecuador. You have to admit, tax knowledge can be fun! This is a paid advertisement for a Galapagos beach raw land for sale. 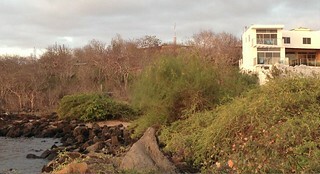 Galapagos beach raw land for sale. Click on images to enlarge. Do you want to buy 816.36 square meters (8,735 square feet) of beautiful, undeveloped beachfront raw land on San Cristobal Island, Galapagos and be fully compliant with Ecuadorean ownership regulations? This is raw land. There is no building on the site at present. My company is a registered Ecuadorean company and is for sale. The company owns the land and is compliant with all local ownership regulations. 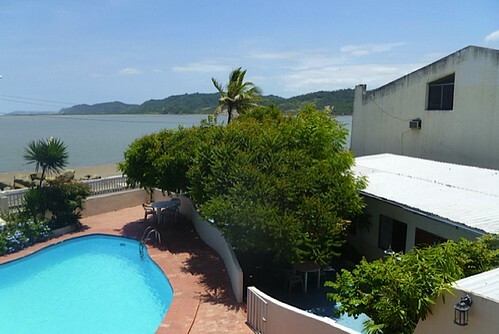 Buying the company is an elegant, turnkey way of owning this prime property on the water near the center of town. 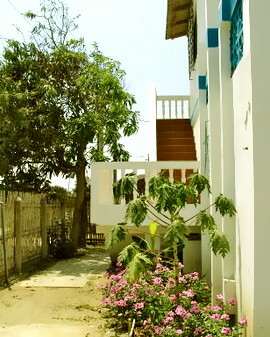 The land sits within the local municipality and in the near future should be accessible by boardwalk to the main street. 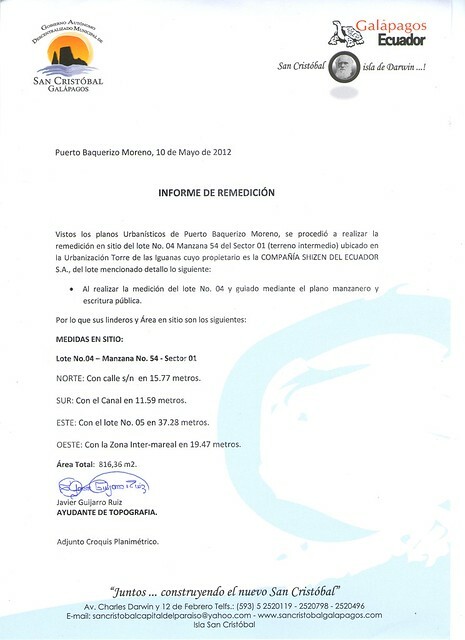 Attached is an Informe de Remedicion documenting the dimensions as well as two maps doing the same. 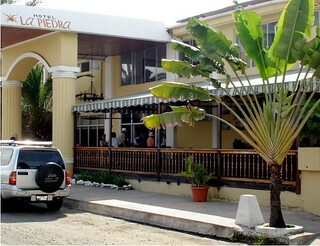 The property was sold by “La Sociedad Nacional de Galápagos C.A.” to “Companía RIDRUEJO S.A.”, on October 5th 1988 and registered with public deed No. 296. 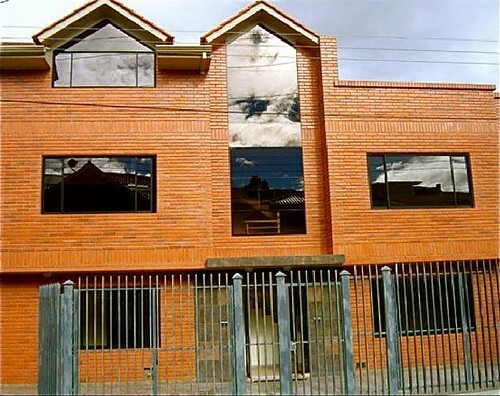 The property was sold by “Compañía RIDRUJO S.A.” to “Shizen Del Ecuador S.A.” on June 22nd 2005, and registered with public deed No. 119. The property is identified as Lot No. 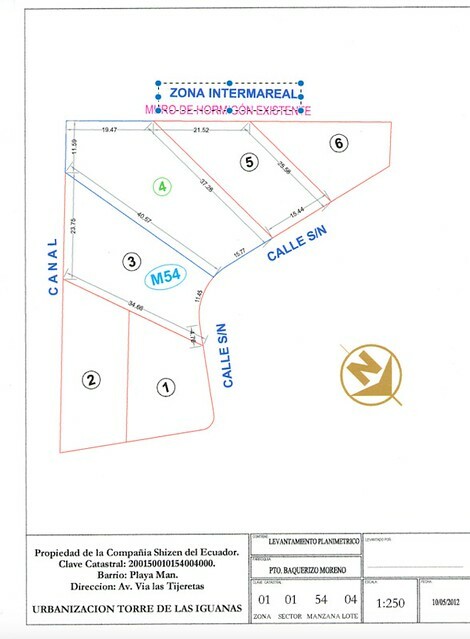 04, block 54, sector Torre de las Iguanas, Puerto Baquerizo Moreno, San Cristobal. The property has no liens, which certifies its validity to be sold. i. 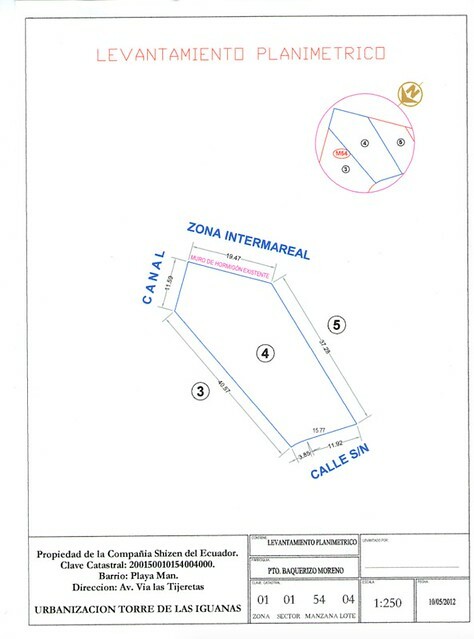 Construction separation area is certified for 3 meters on its boundaries. iii. The maximum height for construction is of 5.70 meters. iv. The maximum floors of the construction is of 2 floors. El Niño phenomenon in Ecuador and the Galapagos Islands. El Niño is the climate pattern created by extra warming of surface waters along the tropical west coast of South America. This affects weather from Australia to the USA, but especially along the coast of Ecuador and South America. El Niño events occur irregularly at two-to seven-year intervals. 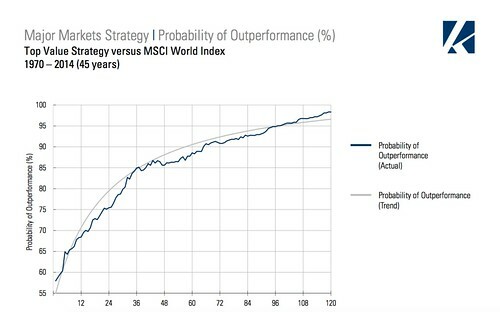 There is no regular cycle. Every decade or two there is an extra strong El Niño. A strong El Niño can bring good news to the US West Coast (extra rain and snow) and the Atlantic East Coast (less hurricanes), but not so good to Ecuador as this can create a lot of rain and flooding on the coast. The National Weather Service, NOAA, El Niño Synopsis (1) suggests that a strong El Niño is likely this year and says: (1) “There is a greater than 90% chance that El Niño will continue through Northern Hemisphere winter 2015-16, and around an 85% chance it will last into early spring 2016. Many of our freinds in Ecuador have been writing to us about El Niño. 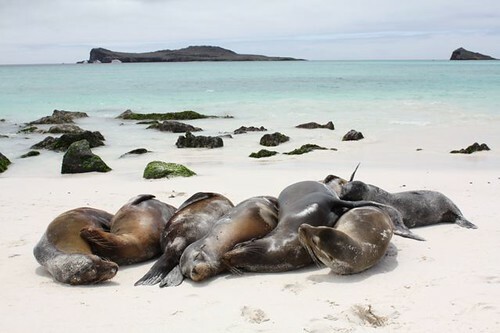 Kjetil Haugan at Haugan Cruises sent this note: “The El Niño phenomenon has arrived this year and there are many concerns about its consequences in the Galapagos Islands. Although this natural phenomenon is unpredictable and its consequences will depend much on the behavior of the underwater currents, we are currently experiencing some of its effects on the navigation. Strong winds have presented in the archipelago making navigations irregular due to the waves; this is reduced by the double hull of our Catamarans making the navigation more stable in comparison to other boats. 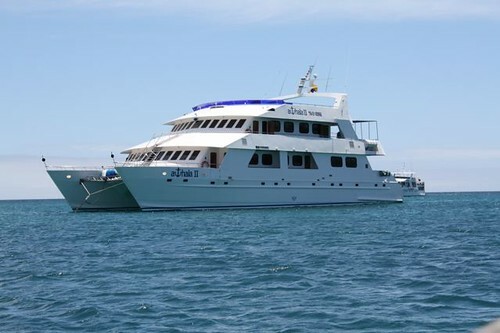 Haugan Cruises offers Ecuador Living Club members 10% to 15% discounts on Galapagos Cruises. See more here. 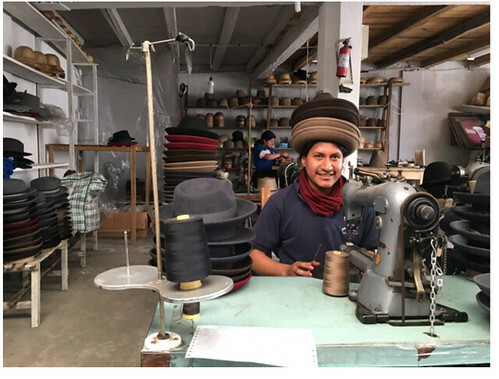 Roberto Ribadeneira, the Ecuador exporter, who just set his dates for the next Ecuador export tour wrote this: Gary, a number of things have been happening here. The most important were serious rumors that Cotopaxi might erupt. However it appears that it is just throwing smoke and has been in the same stage for three weeks now. For a while it seemed that it was escalating and may have been worse. We are excited about the export tour because we have been having great success in marketing with ac ouple of Rotary Clubs in the USA and helping them raise funds. There is also El Niño hitting the Coast in November, which they say is going to be the worst in the last 15 years. Since we will be on the other side of the country in the Andes El Niño won’t affect us directly, but also the government has $800 million to help in case things go as bad as predicted. 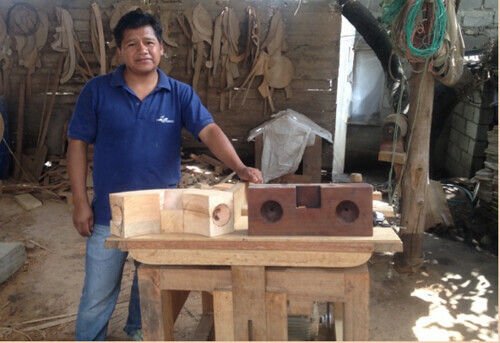 Learn more about Roberto’s export tour below. Currently Ecuador’s coastal weather does not seem to be affected by El Nino. However it is a good idea to check weather.com (2) if you are planning a trip. 3 Day – Two for One – Early Bird Special. 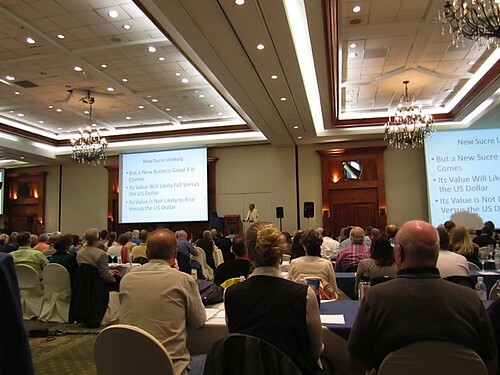 Attend Oct 17-18 Value Investing Seminar and Ecuador Export Tour for the price of one. Save $499 to $799. The cornerstones of everlasting wealth are – #1: Extra earnings, #2: High Value Investments #3: Greater Tax Savings #4: Good Natural Health. 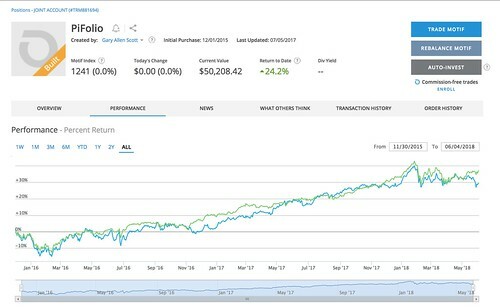 Learn how to preserve your wealth, gain cash on reduced tax and improve your natural health at the Value Investing Seminar in Jefferson, North Carolina October 17-18. Normally $499 single $799 couple. See details here. 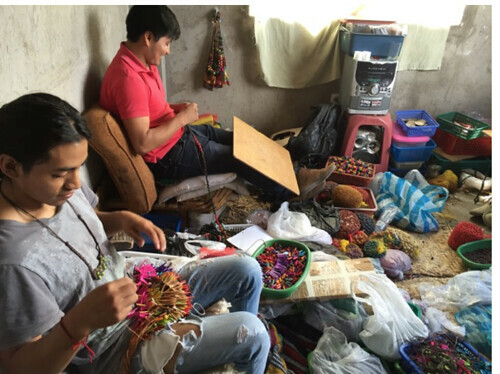 Then learn how to earn extra income with an Ecuador export business in Cotacachi and Imbabura Provence Ecuador, November 11-12-13. Normally $799 single $999 couple. See details here. Enroll in both the seminar and Tour for the price of the tour. Save $499 to $799. Here are Galapagos Yacht Cruise specials for 2015. Our friends at Haugan Cruises operate the three of most luxurious cruise ships in the Galapagos. Kjetil Haugan, operates two of the newest, most luxurious Galapagos yachts in Galapagos Comorant and Ocean Spray. 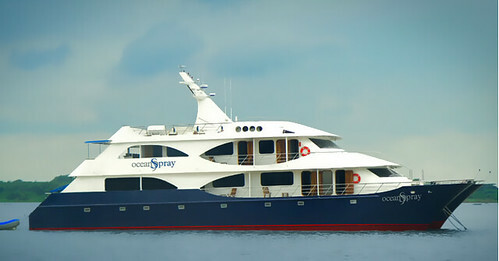 The Ocean Spray is by far the best 16 passenger vessel cruising the Galapagos. 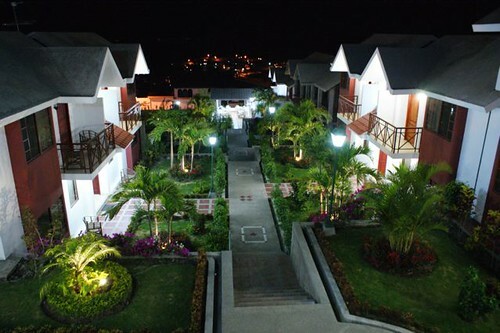 The Ecuador Living Club offers a really special benefit. The decoration was done by Kjetil’s wife, Jessica and her friend, so you can enjoy the Galapagos and the ultimate in cruise luxury. 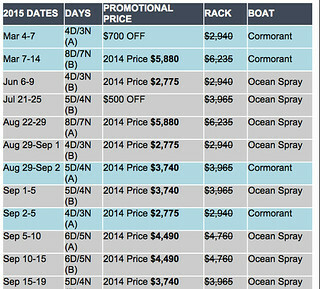 Here are special rates for Galapagos yacht cruises for the rest of 2015. Click on schedules to enlarge. Ecuador Living Club members receive an additional 10% to 15% off the discounted fares. We as publishers do not (and never have) accepted commissions on real estate, travel services, cruises, rentals or any of the services we write about. Because we have a huge readership and because we have worked with Kjetil since he arrived in Ecuador almost 2 decades ago… we could receive this 15% commission but pass it along to our Ecuador Living Club members in the form of a discount instead. The savings is as simple as that. Galapagos tours are great and we have worked with the best Galapagos cruise line (Haugan Cruises) since they began. The problem is that the cruises are such a success that the company’s two yachts are running 98% full. Getting the right tour at the right time can be difficult. However, help is on the way! Haugan Cruises has a new yacht, the Petrel. The Petrel tours are now open to sales. Petrel is a bit bigger actually than Ocean Spray. 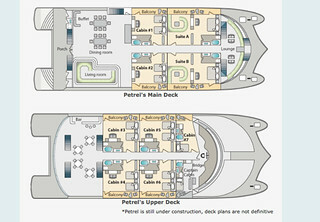 The overall deck plan is similar but Petrel has two suites in the front. All cabins have private balconies and huge bathrooms. Petrel is scheduled to launch in July. 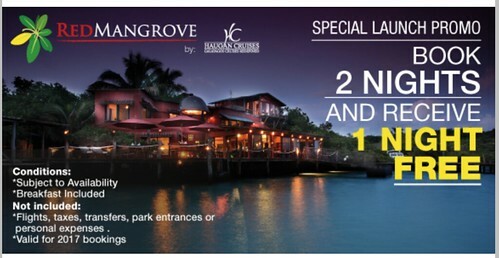 Ecuador Living Club members receive a 10% to 15% discount on Haugan Galapagos cruises. Members can find Petrel’s itineraries, departure days at their password protected site. 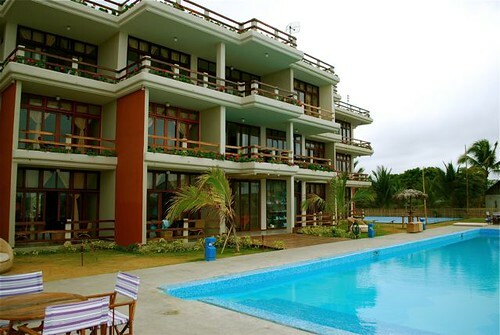 Ecuador Living Club members can get full details here. 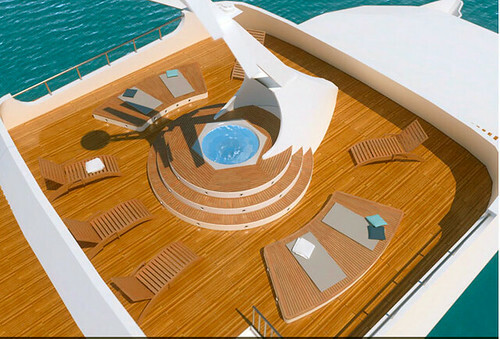 Haugan Cruises also has a fourth yacht under planning. This yacht will be very different from what is currently available in the Galapagos today. The start of construction is scheduled for August/September. 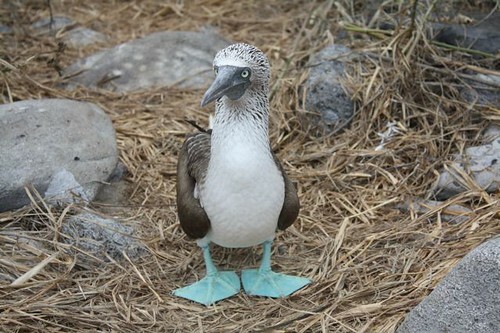 Stay tuned to this site for specials on Galapagos cruises. 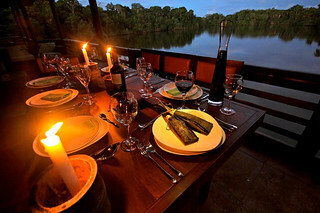 Here is a Galapagos fare you’ll never see unless you are a travel agent, or a reader at this site. 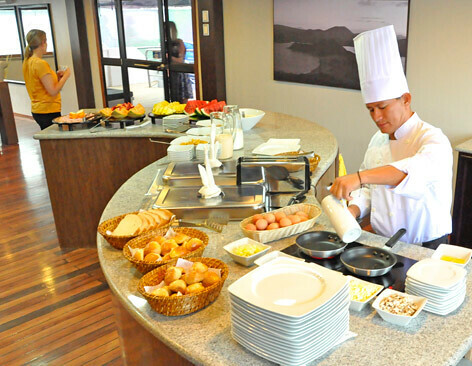 That is because many hotels and tour companies treat Ecuador Living like a travel agent. They make us the same offer to us as they do travel agents. In this case the offer is a 15% commission… as much as $774.75 for an eight day tour . Any advertising you would see for Galapagos tours would have higher fares. The difference is we do not take a commission. We ask the travel companies and or hotels to pass this onto our Ecuador Living Club members as a discount. 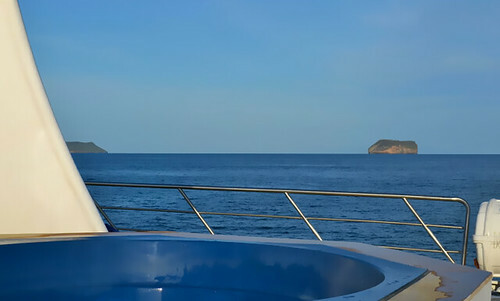 If you are planning a Galapagos cruise there will probably never be a time when you can go on a luxury cruise for less. Learn how to save 10% to 15% off the fares as an Ecuador Living Club member below. Save time and money in Ecuador… gain security, safety, contacts and friends in the Andes, Amazon, Galapagos and on the Pacific. Ecuador has it all. Whether you want to move… start a new life… have an adventure or just have a wonderful relaxing escape. You can have them all and you can have them better for less with 11 benefits you gain as an Ecuador Livings subscriber. Benefits and Savings: You save hundreds… even thousands of dollars on hotel discounts across Ecuador. One club member just wrote: Hi, I am in Cuenca with my family, wife and 2 little ones. Was wondering if you could help me with a driver from Quito airport at 9:20 am, Friday August 12, to Hotel Land of The Sun for 1 nite. Want to go to the markets Saturday on the way back to Quito and the Radisson ( thanks for the great rate!). Will need a driver for that also. 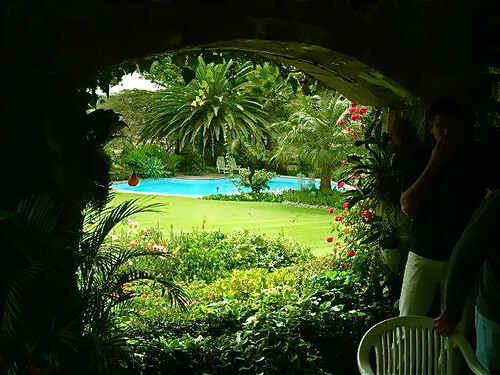 We stayed at Palmuzul 3 nites at 40% off and reduced rates at the Radisson in Quito and La Piedra in Bahia de Caraquez. Thanks for already saving us a fortune! Looking forward to seeing Cotacachi before we head back.Thanks again. This member saved far more than the cost of a lifetime membership in less than a week. 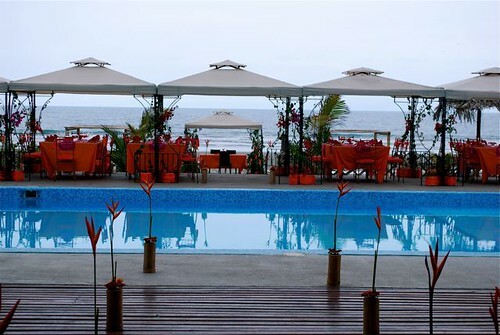 We provide discounts at hotels across Ecuador. Here is a review of a few below. First let’s review all the benefits of membership. Benefit #1: An Ecuador Living Club membership makes it easy for you to know and enjoy Ecuador in the fastest, safest, lowest cost, most efficient way. As a member you have access to our contacts developed over 15+ years in Ecuador… guides, attorneys, doctors, dentists, alternative and complimentary healers, real estate sellers and apartment/condo owners, guides, airlines, hotels and so much more. Our long experience and wide range of contacts means we have learned some inside angles…allow you to have the connections and to know the hot places and where there is risk and even danger. Club membership helps protect you from scams, mishaps and over-charging when you are in Ecuador. 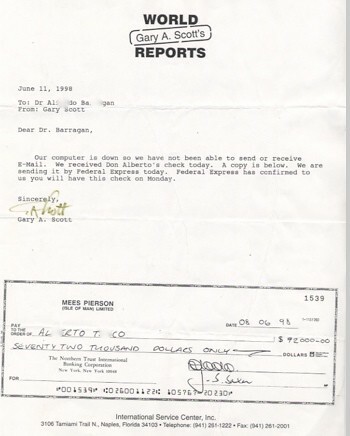 For example in the report you’ll receive free as a member you’ll see the common error I made (even as an experienced overseas businessman) that cost me $72,000 on the purchase of my first Ecuador property. This knowledge alone is worth thousands of times the club membership fee. Yes that’s $72,000 and it was gone! 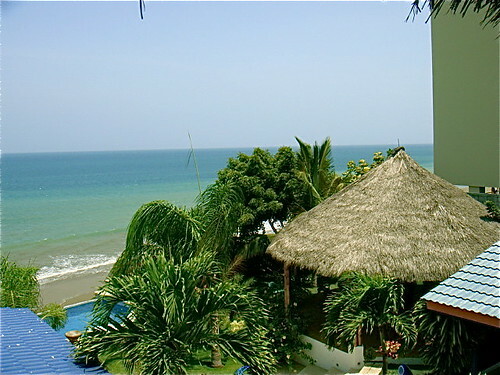 You’ll want to know why before you buy Ecuador real estate. If you have an interest in traveling, investing, living, buying property or doing business in Ecuador, a subscription to Ecuadorliving.com brings many benefits. One huge benefit in using our service is our experience, advice and connections. We are not selling real estate, travel, hotels. We do not accept commissions. We gain the lowest prices for the best quality real estate, travel deals, hotels and other services because of the size and longevity of our site. We pass all savings generated… all discounts to club members. For our modest subscription, you get our honest opinion based on 45 years of international business and 15 + years of living, traveling, investing and doing business in Ecuador. You gain access to our extensive contacts plus you get to share the input from over 30,000 subscribers. 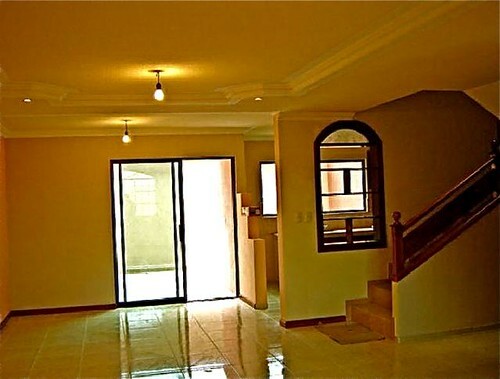 You reach Ecuador’s real estate market in the most efficient way. 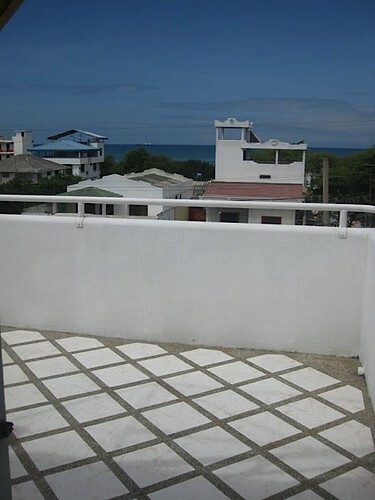 Benefit #2: Get the honest scoop on real estate deals all over Ecuador. clubhouse for a lovely lifestyle. 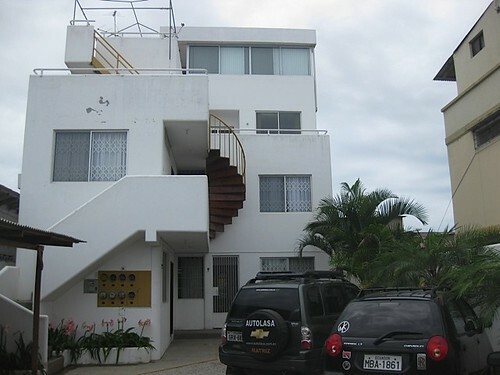 Ecuador Living is a publishing company and that does not sell real estate. We have over 30,000 readers and are continually sent offers for real estate for sale which we place as paid advertisements. When we see special offers we let club members know in advance of the general public. four blocks from the center of town. 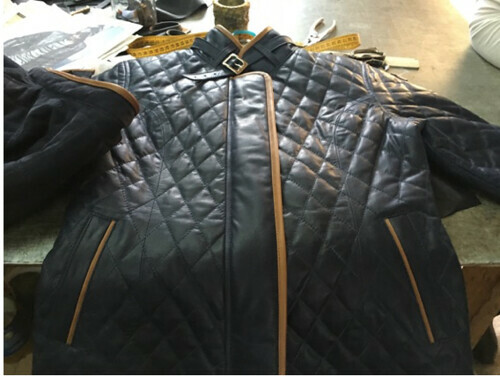 Quality is not lacking. The asking price was only $44,000. 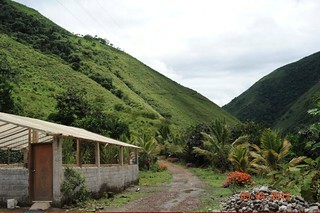 $175,000 Ecuador coffee farm entrance. 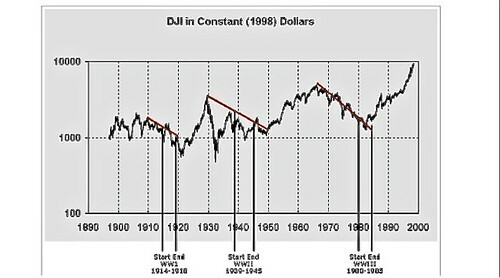 This early warning was important as the farm was only in the market for three days. There are really great opportunities in rural, agriculture property as well. 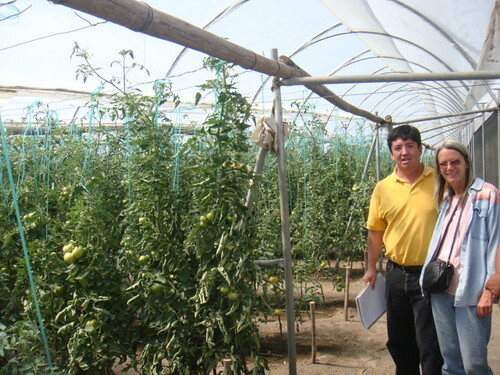 Here is an organic producing tomato farm purchased with an Ecuador Living club advance listing for $85,000. $25,000. We gave our subscribers an early password protected note advisory so they knew this was available before our regular readership. These are prices you will not often see. Great bargains are becoming harder to find and they are snapped up quickly so the early warnings offer a special way to not only save but get the best deals. Benefit #3: Part of your subscription includes a copy of the $49 page report “Ecuador Land of the Sun.” We email it to you at no added cost. Benefit #4: You are provided a password to receive exclusive updates about what is going on in Ecuador. For example we recently let members know of a new… but little known Ecuador law that can cause anyone driving to spend three days in jail. 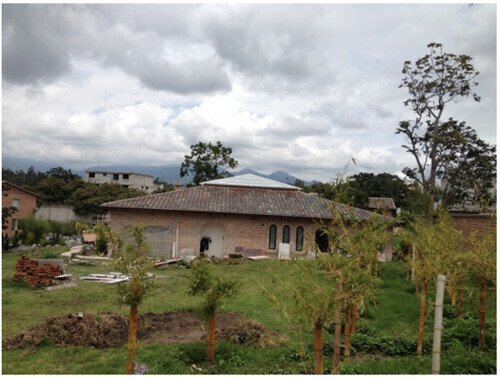 Benefit #5: Hotel Savings across Ecuador. Most people who visit in Quito stay at least two nights (arriving and leaving) so the hotel savings alone can exceed the cost of subscription. 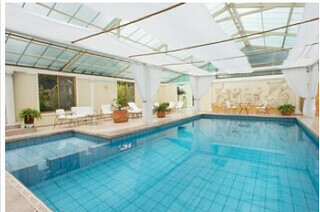 One of the hotels is the boutique hotel, Quito Stubel Suites & Café. See more on the Stubel and its incredible views here. Another Quito hotel benefits at Boutique Hotel Mansion del Angel Quito as well. See more on the mansion here. 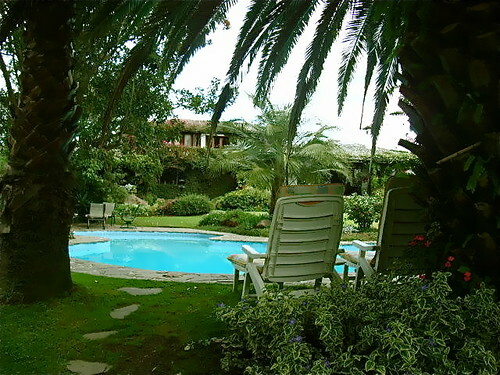 In the northern province you are entitled to a free nights stay for two (worth $72) at Inn Land of the Sun (formerly Meson de las Flores) in Cotacachi on your first visit to the Andes. Volcanos…hot springs for soaking….amazing waterfalls…endless beaches…Amazon adventure lodges. 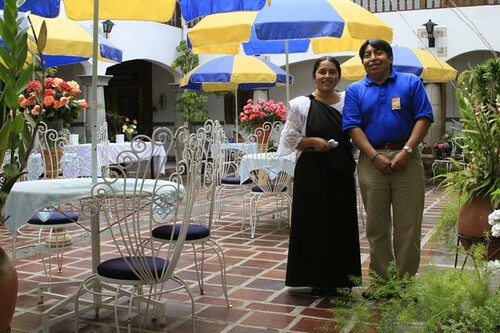 In the Andes you can dine Al Fresco in many wonderful places like the courtyard of this colonial hotel Inn Land of the Sun. Inn Land of the Sun. When Club members stay three nights, the fourth night is free. You are also entitled to free use of wireless internet at the Inn and the VOIP phone system (free calls to Europe, Canada and the US) even if you do not stay at the hotel. 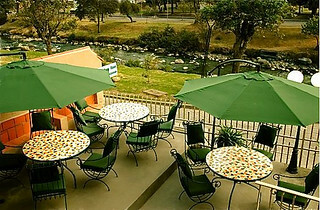 The Relais & Chateux La Mirage Garden Hotel & Spa in Cotacachi also offers upgrades on a space available basis. 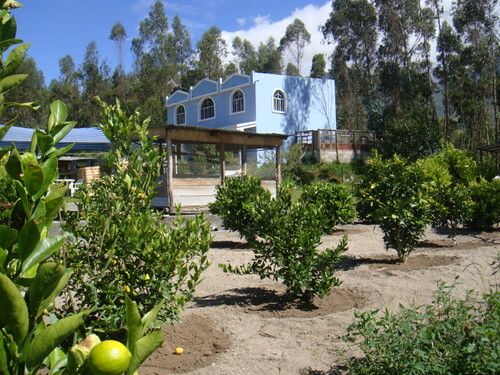 Cuenca is in southern Ecuador and Cuenca hotels offer discounts to our readers. and the five star Hotel El Dorado. Discounts or free nights if you stay three nights are available at several coastal hotels. Benefit #6: Savings Ecuador Amazon & Galapagos. 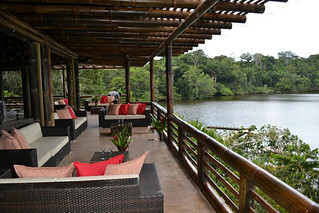 La Selva Jungle Lodge is one of the best lodges in Ecuador’s Amazon and it was recently renovated. rejuvenation. This is the main lodge. 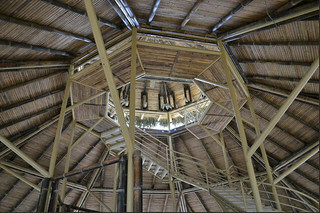 La Selva Lodge has been in operation since the 1980s, offering incredible eco tours… jungle treks… free birding… wonderful cuisine… a true adventure that supports the indigenous community and environment. One visit to La Selva saves far more than the cost of membership. Yet hotel savings is just one small part of many club benefits. Huge Savings on Galapagos Cruises. 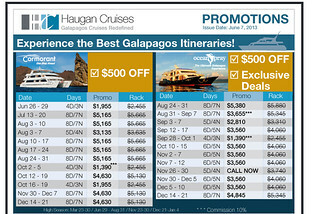 Ecuador Living works with Haugan Cruises, the largest online seller of Galapagos cruises, to provide subscribers with great Galapagos cruise deals. Then the savings can be up to $554 more! 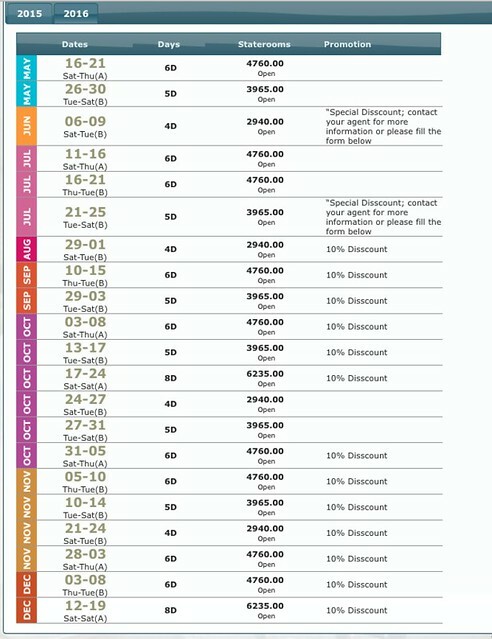 Ecuador Living premium subscribers save another 15% off the already low Ecuador cruise prices shown. Most travel agents charge 10% to 15% commission when they offer Galapagos cruises. We do not take a commission and pass the 10% to 15% discount along to our premium subscribers who help support this site instead. Here are two examples. A 4 day cruise on the Galaven was offered, normally $1,195 per person for just $598 per person. Ecuador Living premium subscribers got another $59 discount so the cruise is an incredibly low $539 per person. On premium cruises, an eight day luxury Athala cruise was normally $4,695. 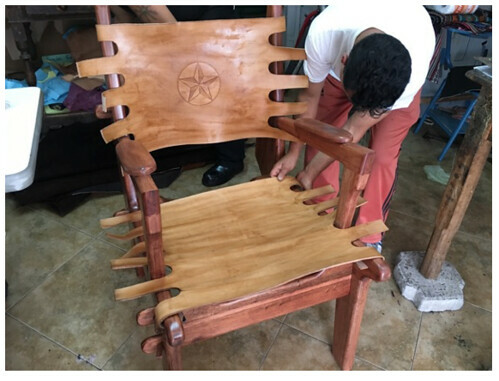 The discounted price was $3,695. Ecuador Living subscribers receive an additional $554 discount so this creme de la creme eight day cruise was only $3,141. Benefit #7: Extra security as well as savings. Your Ecuador Living helps you gain the most efficient access to Ecuador’s real estate, tours, opportunities and contacts. You save time. When your time is limited, you cannot afford to wait or worse miss seeing what you want because a seller or tour guide is a no show or you cannot find a location. The A Team Ecuador can help review your activity in advance. We have helped thousands of subscribers travel to Ecuador so we know the most efficient and enjoyable ways to travel. Plus someone who is multi lingual is always available! We introduce to you to English speaking attorneys who have served hundreds and thousands of club members… so as a member you receive special, lower pricing. You Save Money! Having taken thousands of delegates to see Ecuador real estate and on literally every type of tour over the past decade, we know what prices should be. Subscribers can avoid overpriced tours and property. 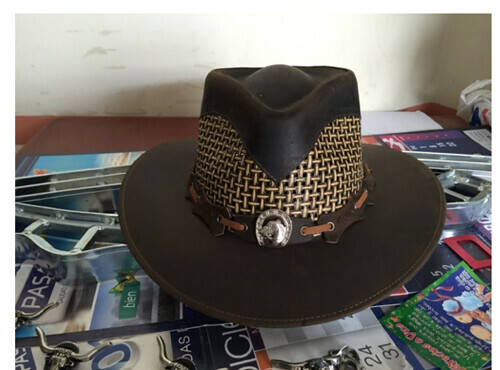 Sellers, tour agents and professionals know our reputation for bringing buyers to Ecuador and that we do not charge commissions so they often give our subscribers excellent deals because Ecuador Living is like free advertising for them. You Gain Enhanced Safety. Our tour guides know which areas in Ecuador are to be avoided. They know which restaurants would make you ill. Plus we maintain a list of English speaking Ecuador attorneys who have successfully helped many delegates buy real estate and conduct business deals as well as obtain visas and residence. 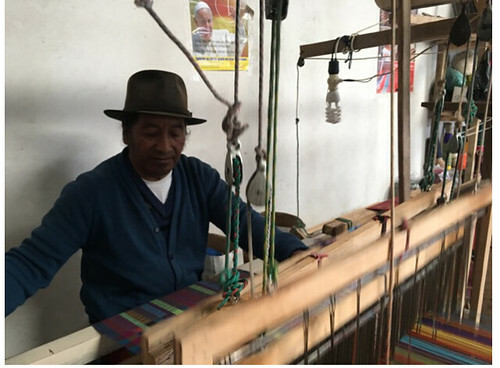 We do what we can to make Ecuador a wonderful experience. Take for example the true story of one subscriber who had his carry on suitcase stolen. He lost everything, passport, wallet, car keys, credit card, driver’s license. He was stranded on a Sunday morning with $3 left in his pocket. Fortunately he called our headquarters in Cotacachi. 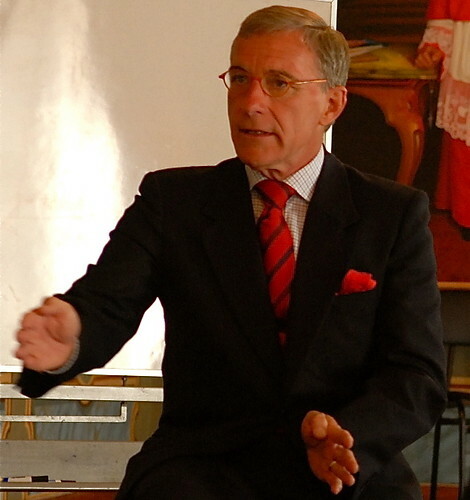 We called our long time friend and attorney, Dr. Andres Cordova, in Quito one of the many contacts we provide to our subscribers. Andres immediately left his Sunday afternoon lunch and within the hour had picked up our delegate given him $200 cash and sent him back to us in Cotacachi. (The US Embassy would not help the delegate until the next Monday). We gave him another $450 and put him up for two more nights at the Land of the Sun Inn. “Hi Gary and Merri, Well, I made it back and I really, really appreciate your helping me out. It relieved a lot of potential stress, and the whole incident was a wake-up call to crises preparedness. We hope you’ll never need this benefit but if required your A Team Ecuador is there for you. You can have all this for even less in a more efficient and safer way. Having an Ecuador Living subscription is like belonging to a nationwide club that helps you save time and money… gain security, safety, contacts and friends in Ecuador. 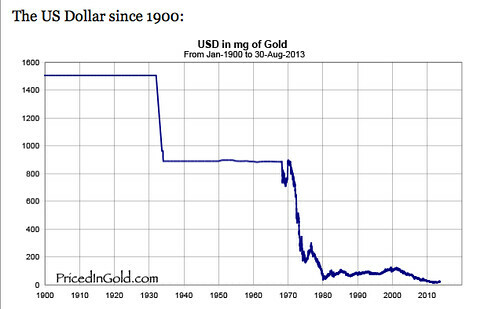 Subscribe one year here $119. The benefits of Ecuador Living go far beyond the ability to purchase houses, condos and farms at a low price because Ecuador really does have it all! The Lifestyle is easy and filled with beauty, friendliness and charm. There is good law and order. Ecuador’s constitution guarantees equal rights including real estate ownership for anyone… regardless of nationality. There are wonderful spas… Amazon adventures…excellent fishing… the Galapagos… incredible shopping… colonial charm in the Andes… haciendas. 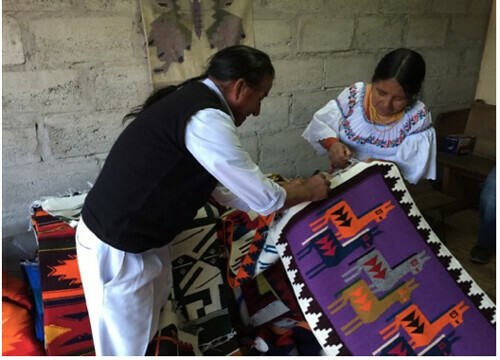 Or find wonderful ways to buy crafts like these carpets (and hundreds of other items)…perhaps even earn income from around the world. Live like a king on $2,000 a month (with a maid, gardener and driver) in a land where the sun shines almost every day and temperatures never drop below 50 degrees but never reach 80 degrees either. Dine here on the coast. enjoy a meal with this Andean view at a fraction of the cost that you would pay in North America. Ecuador offers healthy living. The food is fresh. A great massage costs as little as $25. Medical and dental costs are so low that most people do not even get health insurance. A teeth cleaning is $15. Crowns are about $300. A doctor visit perhaps $15… simple operations only $50. Hospitals and ambulances are free. 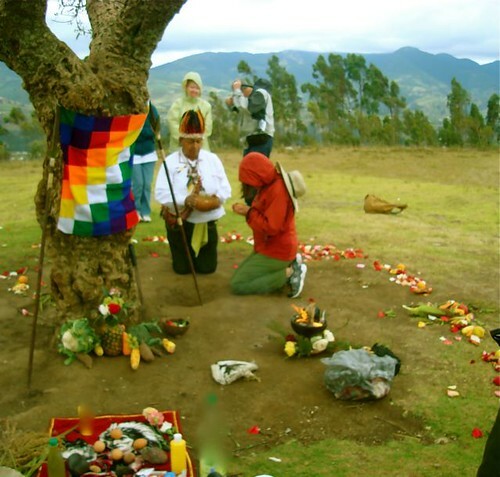 There are also great alternate health opportunitities provided by Ecuador shamans and shamanas. 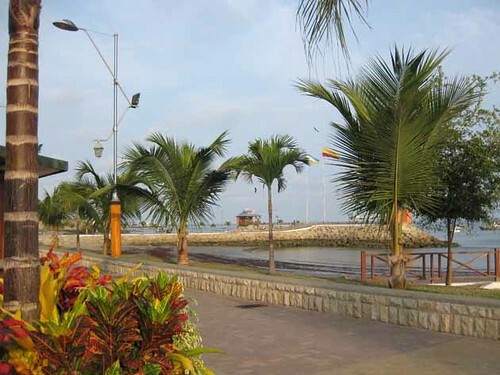 Simply put, Ecuador has it all, beauty, convenience, low cost and opportunity. Ecuador is the closest source of direct sunlight 365 days a year to the US (just 3 hours and 45 minutes from Miami). The topography ranges an amazing sea level to over 22,000 feet. Going from the coastal plain into the mountains of Ecuador, the bio diversity is the same as going from the equator to the Arctic Circle. Ecuador has it all… for living… opportunity, travel, better health, beauty, peacefulness or an adventure! If you are coming to Ecuador or just want to know it all, subscribe to Ecuador Living and enjoy being a member of the Ecuador Living Club! 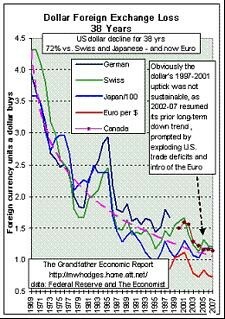 Fight inflation. See expanded Galapagos cruises below that can bring Galapagos cruise savings to you. 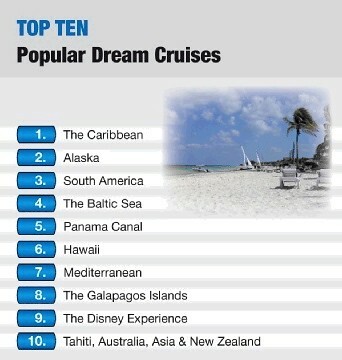 According to to Tour Magazine a galapagos cruise is among the top ten dream vacations. However the cost of some Galapagos tour can exceed $5,000 a person and with gas prices rising this could grow worse! we have some good Galapagos cruise news because we have been working closely with Haugan Travel (the largest online sellers of Galapagos cruises) for many years. Now Haugan Cruises has expanded its fleet so our readers can gain huge discounts on Galapgos cruises and Ecuador Living subscribers can enjoy a Galapagos cruise for as little as $509 per person. Haugan Cruises has added three new vessels so they have a broader range of cruises to suit all budgets. They now have 5 vessels and are offering several special introductory tours. This creates special savings up to $1,000 for all our readers and provides Ecuador Living premium subscribers an extra savings of up to $554 more…. a total of $1,554 saved. Haugan Cruises has offered Galapagos cruises on 5 star vessels for many years. They are the largest online seller of Galapagos travel worldwide. However there are three levels of cruise service in the Galapagos so Haugan Cruises has now expanded to provide service in all classes. This means that readers can enjoy a broader range of cruises (at a discount I might add). The Athala. Pictured above, this is a 5 star motor catamaran that carries 16 passengers and has a superb reputation for service. 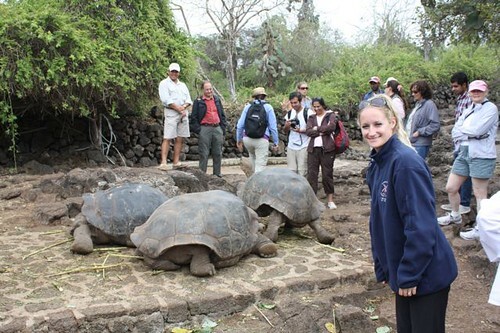 Haugan tours is the company we chose to help us with our daughter’s honeymoon trip to the Galapagos. The happy couple cruised on the Atahla. See their journey here. Cormorant. This 5 star motor catamaran also hosts 16 passengers, has private balconies and is brand new. Cruises start in July 2011. The Ocean Spray is a 5 star mega catamaran for 16 passengers. 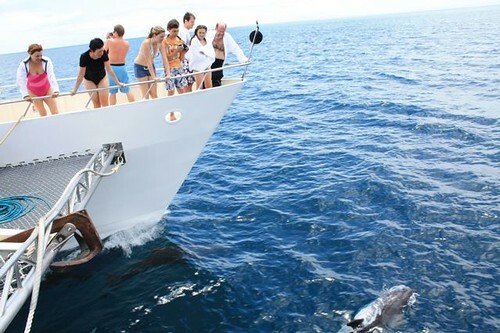 This ultimate Galapagos experience starts in November 2011. The Queen of Galapagos, a 4 star motor catamaran carries 16 passengers in huge cabins and offers some amazingly low prices. The Galaven, a 3 star Expedition Ship carries a larger group (20 passengers) and offers excellent value. Save up to $554 more! Ecuador Living premium subscribers can save another 15% off these already low Ecuador cruise prices. Most travel agents charge 10% to 15% commission when they offer Galapagos cruises. We do not take a commission and pass a 15% discount along to our premium subscribers who help support this site instead. Here are two examples. 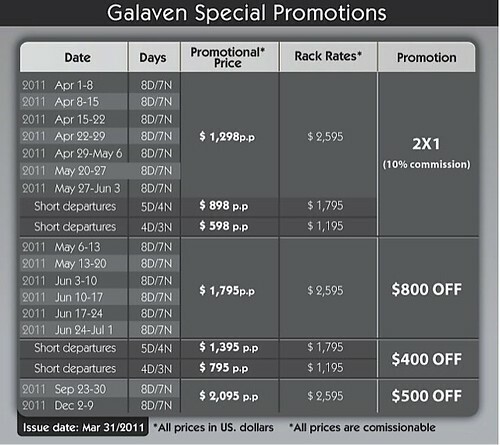 You can take a 4 day cruise on the Galaven, normally $1,195 per person but in this two for one promotion each can go for only $598 per person. Ecuador Living premium subscribers get another $59 discount so the cruise is an incredibly low $539 per person. 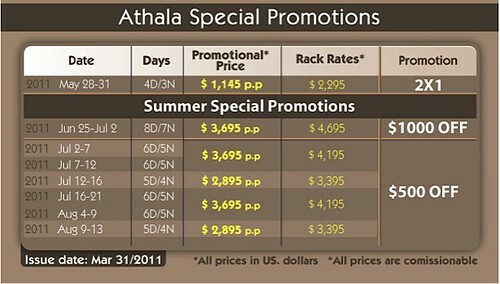 If you choose a premium cruise, an eight day Athala cruise is normally $4,695. The discounted price shown above is $3,695. Ecuador Living subscribers receive an additional $554 discount so this creme de la creme eight day cruise is only $3,141. If you are not an Ecuador Living premium subscriber, learn how to subscribe here. One More Galapagos Cruise Feature. If the Haugan fleet of boats is not quite what you are looking for, or if there is not availability during your travel, Haugan Cruises then will allow us to get you a great deal. Check out their www.galapagosislands.com website. It is the biggest online seller of Galapagos travel worldwide. Learn more on five ways to fight inflation at our June International Investing & Business seminar. 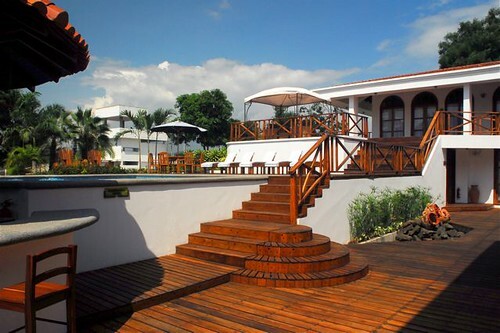 Here is another Galapagos Special with some really incredible savings. We do not sell tours nor are we financially involved in these tours in any way. This means our Ecuador Living subscribers get the same price a travel agent would… becase the tour operator does not have to pay a commission. You save hundreds even thousands of dollar. We work only with the best Galapagos cruises. Yet watch for really special deals like these below. 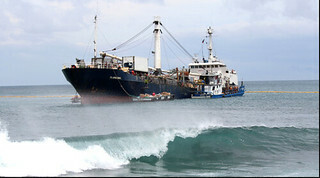 This boat is the Athala and has 10 crew members. There are 16 guests maximum. The first deck is where you eat, meet, watch videos. There are 4 double rooms. 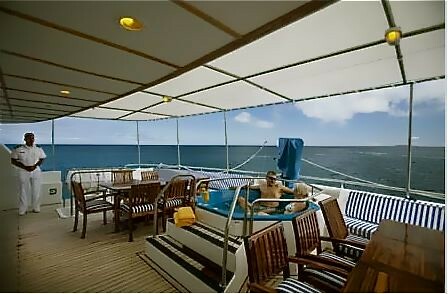 The second deck has a jacuzzi, bar and again 4 double rooms but with balconies, very posh! You’ll go snorkeling with sharks, turtles, sea lions and a plethora of sea life. The White Tip Reef Sharks, about 7 foot long, are not dangerous due to the large amount of food in the reef. You may see and swim with a pod of wild dolphins. Plus of course there will be plenty of sea lions relaxing on the beach and sea iguanas. Here are the Galapagos tortoises. The Galapagos Islands are amazing… well worth every penny, but not inexpensive. So we are happy to be able to put together programs that help readers enjoy the most luxurious Galapagos cruises with four types of savings that amount to a lot. 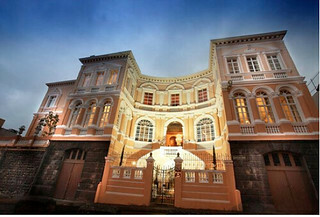 Savings #1: Your first savings is in Quito at Mansion de Angel. Because we refer readers to the Mansion with asking for a commission, Ecuador Living subscribers save $49 a night off the room rate plus a suite upgrade when space is available. See more on The new Mansion del Angel boutique Hotel in Quito here. Savings #2: We track Ecuador airlines and watch for specials. Icaro offers Quito Galapagos special. Normally the air fare for the 600 mile Quito Galapagos flight is around $45o. Icaro has a new flight Quito – Galapagos Quito that at times is as low as $149.99 including taxes. This is a $300 savings. 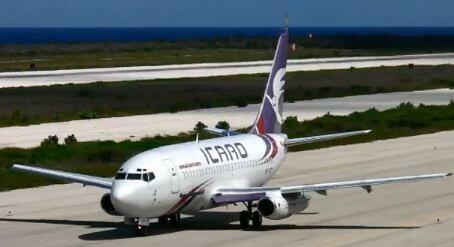 Icaro Air is a small Ecuador airline based in Quito and operates domestic passenger services as well as fixed-wing and helicopter charter flights. They used to serve Cuenca, Loja, Esmeraldas and Lago Agrio, but since 2009 have focused their fleet of two Boeing 737-200 and one Boeing 737-200C on flights to Guayaquil, Manta and Coca. 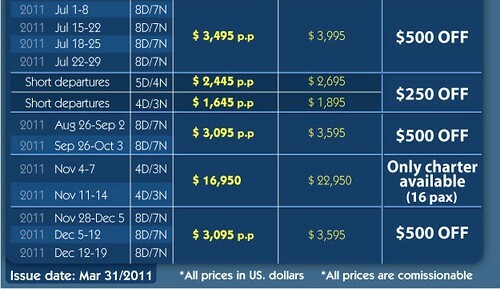 Right now Icaro also has round trip flights from Guayaquil, Coca and Manta for $99. Savings #3: You can reduce your tour price in half on a space available cruise. 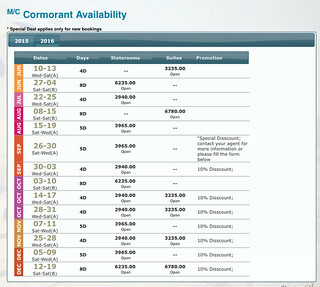 For example the current fee for a four day cruise in December 15, and Feb is $2,095. The last minute price for December 4-7 and February 5-8 cruises is only $1,595. You save $500 per person! The great adventure in the Galapagos of course is the wildlife and nature… the education and the wonderful like minded souls you meet. However gaining all this can be combined with luxury. The Athala II offers one of the most luxurious ways to enjoy this unique environmental experience. 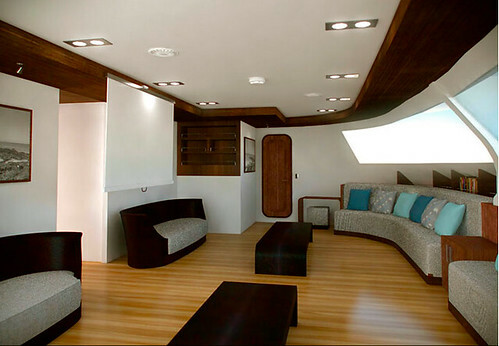 The Catamaran Athala II was specifically designed and built to cruise the Galapagos Islands in style. The elegant design provides more comfort, superior speed, excellent stability and meets all the latest safety standards. You gain generous comfortable accommodations and amenities of larger boats while still preserving the relaxed exclusivity of a smaller vessel. The layout, furnishings, food and crew to be at an excellent standard. 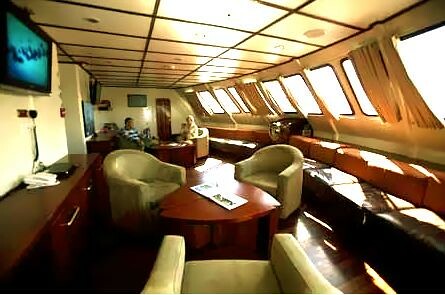 All cabins on board are deluxe, with well-appointed private bathroom, water, air conditioning, wall to wall carpeting. 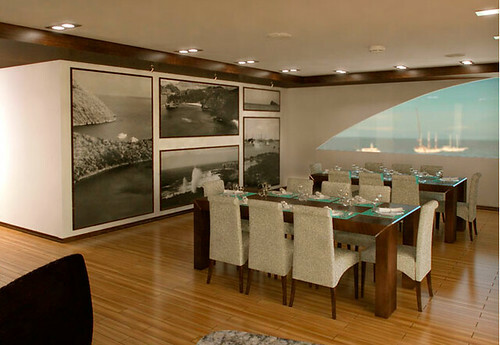 All have ocean views with large portrait windows (not portholes). All cabins are a minimum 175 square feet and the main deck rooms have the additional luxury of a private balcony. The main deck also boasts the dining area and a separate comfortable lounge area complete with plasma TVs, lap tops, DVD player, stereo and library. The upper deck has a well-stocked bar, Jacuzzi and a beautiful open teak deck area for relaxation, alfresco dining and barbeques. The huge sundeck is great for whale and dolphin watching or to simply relax and soak up the sun between island excursions. In the evenings there is no better place for star gazing. You have a crew of 10 + 1 naturalist guide. The crew is friendly, full time, experienced and highly professional. Your guide is guaranteed to be bilingual (minimum fluent English and Spanish) and of the highest standard. Athala simply offers the best there is in the Galapagos. Savings #4: Finally since we can place Ecuador Living subscribers on these tours without commission, you can save 15% more… another $157. Total savings for a couple can be as much as $2,114. $100 (Two nights at Mansion del Angel). Air fare savings $600. Cruise savings, $1,100 and $314 for Ecuador Living subscribers. A Galapagos cruise is a trip of a lifetime and Ecuador Living can help you afford one. See how to subscribe to Ecuador Living here for the maximum savings. If you cannot make it for December or February… let us know dates when you would like to cruise. We’ll then watch for space available cruises on or near those dates and let you know. Send me a note with “Galapagos Dates” in the subject line so we can file your dates and keep you informed. Or gain multiple tour savings.